Shopping for Doctor Who Bobble Heads? You just can't beat having a TARDIS on your monitor! Finely detailed mini bobble head of the Doctor's time machine. Based on the Doctor Who TV series. 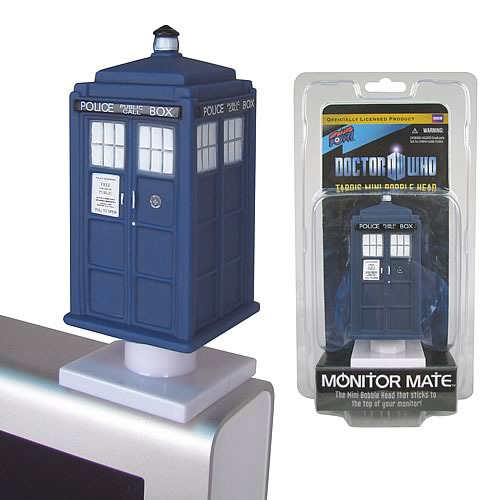 A tiny TARDIS for your monitor! It's pretty tough to top having a TARDIS sitting there on your monitor each time you sit down at the computer. This dark-blue pseudo-phone-box based on the Doctor Who TV series stands about 3-inches tall, not including its white base that includes a non-damaging adhesive pad that adheres nicely to your monitor. The finely detailed mini bobble head of the Doctor's time machine is made of PVC plastic, and the entire TARDIS bobbles. You can't beat that! Ages 14 and up.